While my husband and I were on vacation recently, camping in Virginia, the beginning of the week was a bit too cold for sitting around a campfire and relaxing outside. One evening, we went into town to see a movie (once we figured out that the "late" shows in this small, rural town were at 6 pm!). 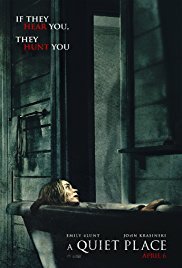 We saw A Quiet Place, a unique, captivating movie that defies categorization. Jon Krasinski (who is well-known for playing Jim on The Office in the US for many years) and his wife, Emily Blunt, star as a husband and wife, Lee and Evelyn (though I didn't know their names until just now). They are living with their three children in some sort of post-apocalyptic world, as the film opens. Noah Jupe plays their preteen son, Marcus; Cade Woodward plays their youngest son, Beau; and Millicent Simmonds is magnificent as their deaf teen daughter, Regan. It becomes obvious from the first scenes that the dangers in this new world are some sort of terrifying creatures that hunt by sound. The family takes great pains to stay silent, first at the deserted store in town where they are restocking supplies and later at their home on a farm. They are all barefoot and have even covered the paths they walk with sand so as to muffle the sound of their footsteps. Fortunately, they all know sign language because of Regan, so they manage to communicate. Right from the start, though, you notice that Evelyn is pregnant, and thoughts of a crying baby (not to mention giving birth) in this silent world add to the growing tension, even before you completely understand the dangers. Watching this movie is a unique experience. For most of the 90 minutes of the film, it is almost entirely silent - no dialogue, few background noises, no music. You quickly acclimate to the family's silent communications, but the suspense builds as you grow to understand what a single noise could mean. On IMDb, this movie is listed as Drama, Horror, Sci Fi, and Thriller, and that sounds strange but is pretty accurate. I've heard it called a horror movie (my son was surprised that I wanted to see it), but it is as much a family drama. The tension lives up to its thriller moniker, and once you get a glimpse of the creatures, you immediately understand that they must be some sort of alien thing, hence the sci fi tag. But this movie is far more than the sum of its parts. Krasinski wrote and directed as well as starred in it, and the full cast listing includes just six people (and "man in the woods" is not on-screen for long!). To create a film with essentially just five characters and all that silence that is so compelling you can't take your eyes from the screen is quite an achievement. As for the scaredy cats wondering if this is too horror-ish...I don't normally like horror movies, and I loved this movie. However, while it is a (very) quiet family drama delving deep into these few characters' lives (I cried at one point), the suspense and tension are high throughout, and there are a few gotcha moments that made me scream and grab my husband's arm! It doesn't take much after all that silence to feel alarmed, especially when you know the new baby will be coming soon. The few glimpses of the creatures are pretty gruesome, though the movie only gets a PG-13 rating, and there is little gore or on-screen violence (but what you imagine off-screen is enough, when it happens). In short, we were both spellbound for 90 minutes. We've told our sons they must go see it! A Quiet Place is still in theaters, and that's definitely the best way to see it, if you can, on the big screen, with silent people around you. Chewing popcorn sounds frighteningly loud! Click the Fandango link below to find theaters and times near you - maybe you have a local recliner theater like we do. It is due to come out on DVD, Redbox, and Netflix on July 3, 2018 (link here and below to pre-order the DVD). Disclosure: I paid for this movie myself. My review is my own opinion.